Bring a large pot of water to a boil. Add the orzo and cook for 13-15 minutes. Drain orzo and place in serving bowl. Whisk the vinaigrette ingredients together and pour over the cooked orzo. Stir the orzo and set aside to cool. Once the orzo has cooled, add the tomatoes, peppers, scallions, and basil and mix. Rinse the shrimp under cold water and pat dry with a paper towel. Lightly coat the shrimp in olive oil. Add a squeeze of lemon juice to the shrimp and season with salt, cayenne pepper, oregano and fresh cracked black pepper. Toss the shrimp to ensure that they are seasoned evenly. 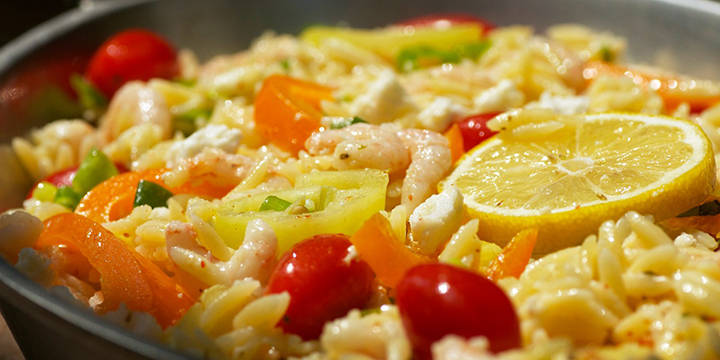 Add the shrimp to the orzo salad. Top the salad with the crumbled feta cheese, mix gently and serve.